Henry Miller has been quoted as saying, “No one can write the absolute truth …”. And I do feel it is a lot harder than most people might think. That would explain the abundance of fiction writers in the world today. The irony is, I get a lot of my truth from fiction, which is mostly what I read. 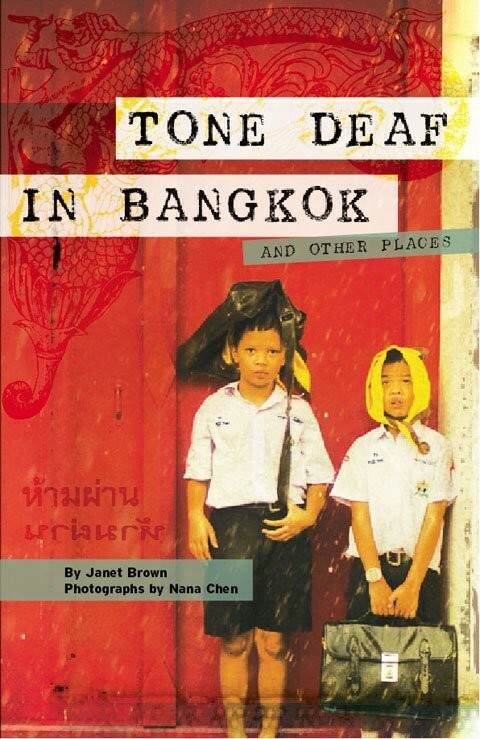 Deviating from my norm, recently, I read TONE DEAF IN BANGKOK (and other places) by Janet Brown. Publisher: Global Directions/Things Asian Press (April 1, 2009) . It is a collection of short stories, real, lived by Ms. Brown. There are stories of humor; stories of courage; stories of friendships made; travel stories and most of all stories of an expat female living in Bangkok, Thailand during the years 1995-2001. The operative word being, living. In these essays Janet Brown does her absolute best to tell her absolute truth. And she succeeds. It is quite an accomplishment. What makes it unique, for me, is the adventuresome, middle aged female perspective, which she brings to the table. It was a fun read. It reinforced many truths of my own about the land of smiles. There were even some shared experiences. If you bring an open mind to Thailand, as Janet Brown did, Thailand is sure to leave a lasting impression. The story about ghosts I particularly liked. Twelve years ago, when I first came to Thailand, I took a western, scientific view of ghosts. I didn’t believe in them. Now, after being around so many people that do, I am open to alternative theories. It’s one of many transformations that can take place in a person that chooses to live in Thailand long enough. I’ve concluded that alternative theories about ghosts are, if nothing else, just more fun. Had I read Janet Brown’s story, GHOSTS IN THE CITY OF ANGELS , 12 years ago I would have been shaking my head thinking, “Who is she kidding?” Over a decade later with six-plus years of accumulated time spent in the Kingdom, I just smile and nod my head up and down. One of my favorite stories was, TODAY, WHERE DO YOU GO? about Janet’s trip to the disputed temple of Khao Phah Viharn on the Thai / Cambodia border. It told me a lot about the author. It is short and sweet and sour all in one. Just like a good day, lived. Her concluding story, FIREWEED AND JASMINE about the lasting effects and affects of growing up in Alaska as a young girl and getting an early lesson in impermanence is worth having this book in your travel collection, for those words alone. I read the story aloud. I recommend it. I also recommend reading TONE DEAF IN BANGKOK (and other places) for anyone with an interest in Thailand, adventure, travel or living. That about covers it. Sounds like the sort of book I would enjoy very much, Kevin. Please let me know publisher, year of publication and where to buy. Thanks. Thanks for that. And I suspect you might be right about me and Janet. Certainly we would have a lot to talk about, having lived in Bangkok around the same time.